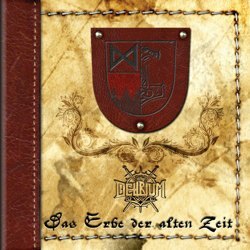 German pagan metallers Delirium from Franconia, proudly unveil the artwork and tracklist of their forthcoming EP entitled “Das Erbe der Alten Zeit” (The Heritage of the Old Time). They call their music Franconian pagan metal and what they play is pagan black / death metal with epic folk melodies, focusing on Franconia’s history and Nordic mythology. “Das Erbe der Alten Zeit” was recorded at the Basement Media Productions Studios and will be self-released, like their 2011′s debut full-length album “Frankenblut“. Artwork is crafted by the band’s singer Manuel Hiller. ”Das Erbe der Alten Zeit” is scheduled for release on the third quarter of 2013, but the exact release date isn’t announced yet.